Here's a picture one of many I took. 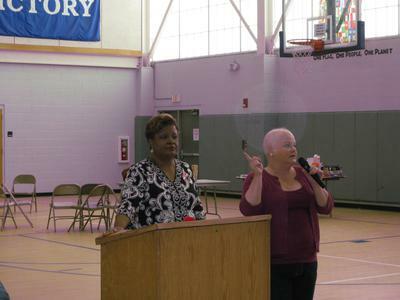 The woman on the left is speaking in public in a gymnasium, she is speaking of her daughter's murder, on Valentines Day, by an ex boyfriend. The woman to the right is going through cancer treatments, and she is just part of the introduction of the woman on the left. Over the head of woman on the right is an orb. I feel it must be the spirit of the woman who is speaking of her daughter's domestic violence murder. My belief is that it could very easily have been the presence of the woman's daughter! Spirits manifest in the form of energy, and the orb is a form of energy.